It wasn’t the first time the scribes and Pharisees made this request of Jesus, and it wasn’t the last time, either. In fact, they were demanding a sign even as Jesus hung before them, nailed to the cross. They wanted Jesus to show them a miracle – proof that He was the Messiah, the Anointed One of God. Let’s consider the irony of this demand for a sign. At the time the scribes and Pharisees were asking Jesus for miraculous proof of His authority (as recorded in Matthew 12), He had already healed a centurion’s servant, delivered two demoniacs from Satan’s power, healed a paralytic, healed a woman who was incurably ill for 12 years, raised a girl from the dead, gave sight to two blind men, restored a man’s withered hand, and brought sight and speech to a demon-possessed man who was blind and mute. And that’s an abridged list. To top it off, the scribes and Pharisees had a front row seat at many of these miracles. They were there. They heard. They saw. And they still wanted more proof. What was going on here? Jesus – in true Jesus fashion – pointed out the real issue to them. It wasn’t a proof problem. It was a heart problem. The scribes and Pharisees weren’t labouring under a lack of proof. They were suffering from hardening of the heart, due to stubborn unbelief. The resulting spiritual paralysis made them what Jesus called “an evil and adulterous generation,” stubborn and rebellious, spiritually fickle, and clamouring for proof that ultimately wouldn’t make a dent in their wall of unbelief anyway. As long as they continually demanded proof, Jesus wasn’t going to waste a sign on them, and He told them so. They would simply have to continue to witness the barrage of signs happening for others in front of their very eyes. You see, the countless people who received miraculous signs from Jesus weren’t asking for proof. They were asking for help. They came humbly and simply to Jesus, asking for the impossible, and trusting that He could do something to help them. For these people, believing was seeing, not the other way around. And they were rewarded for their faith. But those who refused to believe would not receive a sign. With one exception. Jesus said to the scribes and Pharisees, “An evil and adulterous generation seeks for a sign, but no sign will be given to it except for the sign of the prophet Jonah.” The miraculous sign of Jesus’ identity and authority as the Son of God would be strikingly similar to Jonah’s rescue from a watery grave after three days and nights in the belly of the great fish. Only this sign would consist of Jesus literally rising from the dead, never to die again, after three days and nights in a grave in the earth. Jesus also noted a tragic difference between the sign of Jonah and the sign He would soon give to the scribes and Pharisees. He pointed out that the people of Ninevah believed Jonah’s testimony and preaching, and repented, resulting in their reconciliation with God. But not so with the Pharisees. 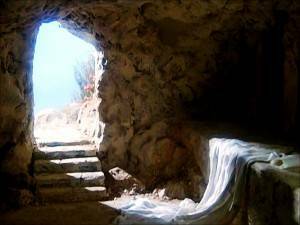 Jesus prophetically stated that, even though “something greater than Jonah is here”, the scribes and Pharisees would not believe the sign of Jesus – His empty tomb. And so it was. Jesus rose from the dead after three days in the tomb, appeared to a total of over five hundred of His relieved and joyful followers over a month, ascended to heaven before their very eyes, and continues to work countless miracles through those who believe in Him, even to this very day. And the scribes and Pharisees, along with everyone since who suffers from an unbelieving heart, stand outside the empty tomb, scratching their heads and looking doubtful – drowning in proof, and yet still parched and paralyzed in their faith. Before we start making the mistake of proudly thinking that unbelief and doubt belong only to those who reject Jesus, let’s recognize that Jesus was constantly amazed and saddened by these qualities in His own followers. Jesus addresses His own disciples as “You of little faith” five times in the book of Matthew. Evidently, unbelief isn’t something that only hinders and entangles unbelievers. It’s something we all struggle with. So if we want to see the Lord work powerfully in our lives, it would be good to move on from thinking Jesus needs to prove Himself to us, praying “God, if You’re really there” prayers. It might be more productive to pray like the distraught father who desperately needed Jesus’ help: “I believe; help my unbelief!” With our faith in Jesus up front – where it should be – many signs will follow.